"You are the chosen one, and I have been sent here to guide you on the path to your ultimate destiny." One thousand years in the past, a great and peaceful civilization existed on the moon, ruled by Queen Serenity. That all changed with the arrival of the evil Queen Beryl (Naz Edwards), whose quest to conquer the universe began with the moon, by unleashing the power of the Negaforce. Queen Serenity's world was destroyed, but as her last act, she sent her princesses into the future, with the only power strong enough to defeat the Negaverse: the Emperial Silver Crystal and the Crescent Moon Wand. While the princesses have lost their memories, two feline advisors, Luna and Artemis, were charged with relocating and protecting these Sailor Scouts, the last hope for peace. And so the story begins. Fourteen year-old, blond haired, blue eyed Serena (Tracey Moore) is not your model high school student. In fact, she is ditzy and lazy, more interested in comics and video games than studying. She is also notoriously tardy, but one morning while rushing off to school, she finds some neighborhood kids harassing a defenseless cat. When she removes the bandage on its head, a crescent moon is revealed, and the cat, who we learn is Luna, senses that this girl may be the one she is looking for. When Serena gets to school and finds out she has flunked her latest exam, her friend Molly (Mary Long) suggests they go to the mall to make themselves feel better. Meanwhile, Queen Beryl is conspiring to steal energy from the humans of earth to fuel the Negaforce, and as her servant, Jedite is enlisted to come up with a plan to meet their end. He decides to use the power of greed as his catalyst, which just happens to affect Molly's mother, the owner of a jewelry store, who announces a massive sale is underway, which creates a mob scene as shoppers line up for the discounts. Leaving Molly to go home and face the consequences of her bad grades, she runs into Darien (Rino Romano), who berates her for scoring so low on the test. She also hears about it from her mother, but while moping around Luna shows up and speaks to her, telling her that she is the Sailor Scout of the moon, that her friend is in danger and that only she can save her. Luna gives Serena a magic locket, and by uttering "Moon prism power," Serena is transformed into Sailor Moon. The two go back to the jewelry store, where its patrons are collapsed from the energy that has been drained from them. 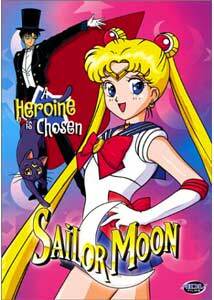 They find that Molly's mom has turned into a monster, who attacks the Sailor Scout. Serena doesn't know what to do, and Luna can only tell her she must fight evil wherever she finds it. Suddenly, a rose appears, and so does Tuxedo Mask, who urges the novice Scout to believe in herself. Luna then instructs Serena to use her tiara while uttering another magic phrase, which dispatches her adversary. Each episode follows a similar plotline: Queen Beryl chastises Jedite for his failings, and he in turn launches another plan to extract energy from the Earthlings, with Sailor Moon coming to the rescue in the nick of time—with a little help from her friends. The fifth episode introduces our next Sailor Scout, Sailor Mercury (Karen Bernstein), and only by working together as a team can the Negaverse be stopped, as the opponents get increasingly stronger. Sailor Moon became immensely popular Stateside after being brought over and dubbed by DiC, �but much like a shoujo equivalent of the Robotech series, it was heavily edited in the process. The original 1992 Japanese version, Bishoujo Senshi Sailor Moon, had a five year run in Japan, for a total of 200 episodes. DiC translated 82 of the 89 episodes from the first two seasons (Sailor Moon and Sailor Moon R), but skipped entire shows in the process. Apart from Americanizing the character names, they rewrote the end of the first season, and changed a few of the relationships in the process. DiC also tagged a moral summary to the end of each installment, some of which are pretty loose in their connection with the episodes. While ADV is apparently working on doing an uncut, Japanese version (the later seasons are available uncut from Pioneer), the first season presented here is the English-only version, which is what was broadcast in the US. I'll admit that I never saw myself as a "moonie," having only caught bits and pieces of the show on TV, and being a fervent "original language snob" as well. However, I was won over by this series, despite its dubious origins. There is ample humor, plenty of action, and the characters are fun—I'm a sucker for a talking cat. The dub acting is decent, even with some of the fake accents that show up. It is also easy to appreciate the attraction this show would have to young girls, as it provides positive role models, and its message that "anything is possible if you have faith in yourself" is admirable. Image Transfer Review: Image quality is generally quite good. Aside from a few overly soft shots, the image is sharp with solid coloration. There is a bit of rainbowing and some minor compression artifacts. Print defects are also minimal, limited to a few specs here and there. Fine grain is well rendered. Audio Transfer Review: Stereo audio is solid, with some directionality and a full-bodied frequency response. There is no distortion or other technical anomalies to report. I was quite impressed with the presentation, which was better than expected. 6 Other Trailer(s) featuring Princess Nine, Ruin Explorers, Sakura Wars, Sonic the Hedgehog, Queen Emeraldas and Lost Universe. Extras Review: There are no on disc extras outside the six ADV previews included. These are: Princess Nine, Ruin Explorers, Sakura Wars, Sonic the Hedgehog, Queen Emeraldas and Lost Universe. I wasn't too keen on the menu layout—the episode titles are arranged in a circle, and don't navigate in the order I would expect. Second, there are no episode numbers, so you need to refer to the packaging (which also isn't numbered) to figure out the order. On the plus side, the accompanying audio plays the whole end theme. The first pressing also comes packed with a Sailor Moon Series III collector card that wasn't included in our review copy. The first disc of one of anime's most popular series, Sailor Moon, makes its way to DVD in a good-looking, low-priced, six-episode set. While many will hold out for the original language version, this English-only presentation is true to the US television broadcast as brought over by DiC.